Do you quilt? Do you wish you quilted? Do you like free stuff and really beautiful patterns? Then you'll love today's giveaway! Vanessa of V and Co. is here to give away her latest pattern! It's totally boy and totally cute. Houndstooth has a special place in my heart. I think it's time I started quilting! If you're new to V and Co. here's the quick rundown: Vanessa shares sewing and design ideas on her blog, sells pdf patterns in her shop, and most of all she's hilarious. Pop over and she'll have you laughing, ooo'ing, sewing, redecorating, and ready to make another quilt. First, V and Co. is offering all MADE readers a 15% discount to her shop (excluding books) from now until Sunday. Just enter MADE at checkout! Second, there will be FOUR winners for this giveaway! Each winner will receive a pdf pattern of the Houndstooth Quilt Pattern. Exciting! And in case you're thinking, "that's too complicated for me", think again! 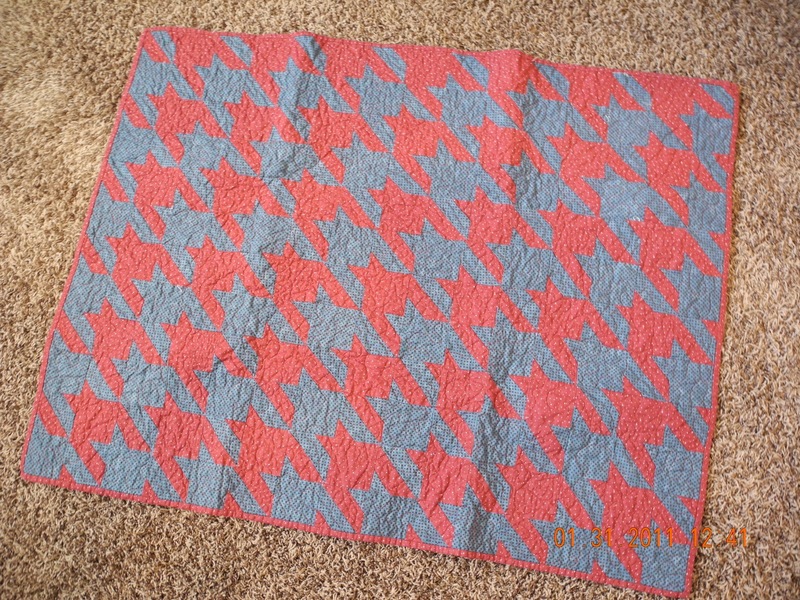 Readers have been sending Vanessa photos of their houndstooth quilts--like this one below by Kelli. You can do it too! * Pattern will be emailed to winners. * Giveaway ends Saturday 3/5/11 at 8pm (Central Time). Winners will be announced Sunday afternoon. oh pick me! i love v and co. i LOVE her just dandy baby quilt. so adorable! i woudl LOVE LOVE LOVE to make this quilt! Love this pattern! Just made a houndstooth pillow, so this would be a perfect pairing. lindsay.conner(at)gmail(dot)com. I've had my eye on this quilt pattern for some time... I LOVE houndstooth! What a beautiful modern quilt! I love the black and white. Looks complicated but I have no doubt there are beautiful pictures and easy instructions! Love it! So fresh and modern. Thanks! This is a great pattern! genius. i would LOVE to win this pattern! it would be SO cute in pink, i'm thinking.....thanks for the giveaway! Ooooh, gorgeous! Thank you for the chance! Thanks for the chance to win! Looks like a great lap quilt or baby blanket! Oh I love all of Venessa's fabulous creations. I've been drooling over the Houndstooth quilt. Thanks for the chance to win! that pattern is gorgeous, I would love to win it! I AM PRETTY NEW AT THIS, BUT WOULD LOVE TO TRY TO MAKE THIS QUILT! 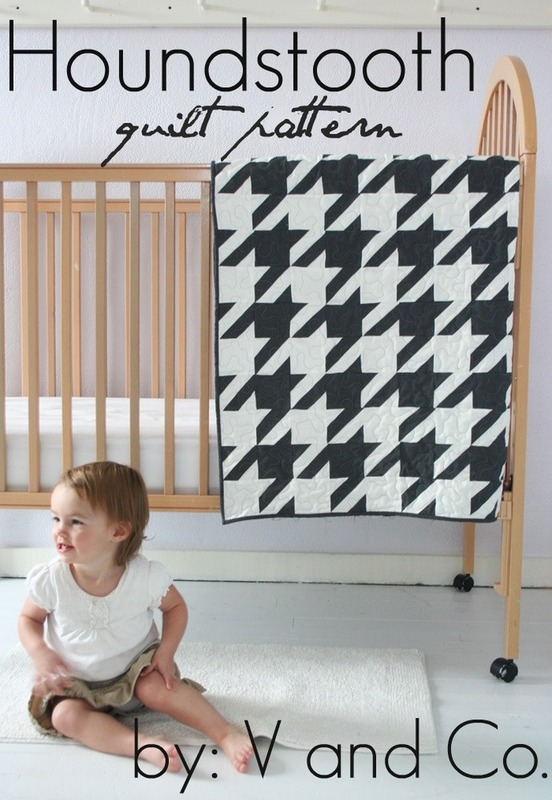 love love love this houndstooth quilt! That quilt is amazing! I would love to learn how to quilt and have that be my first piece. I AM a quilter, and I love that houndstooth pattern! Great for boys (or girls)! Oh love this! I'd love to give it a try!! EEEE! This is so darn cute! Absolutely gorgeous! Would love to try this! and i would L.o.v.e to make this quilt!! CUTE!!! :) I'd love to win!!!! Pick me! I would love to learn to make that. I love to sew. i love to quilt. i just keep running out of time to try these beautiful ideas!!! I've been drooling over this since she released it! I've got to try it! I love her patterns! Thank you for the giveaway! This quilt has been haunting my dreams for weeks! Just kidding, but seriously I am dying to make it. I promise to take lovely photos of my little enjoying that quilt. Oh my goodness. I would love to make this. You are an amazing quilter, I want to be like you!!! Seriously though, I have really been wanting to make a quilt for my little one, I would love to make this one. I hope I win!! Oooo! 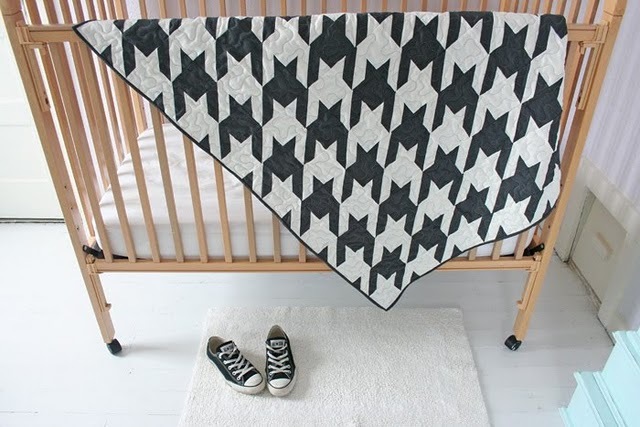 I have loved this quilt since first seeing it on V and co. and with 2 boys of my own, would love to make this quilt! Hope I win!!! Oh I've loved that quilt since the moment I laid eyes on it! Fingers crossed! Love the oversized houndstooth. Would love to win! How fun is that! I'm already playing with color combinations! I would love to win the pattern!!! I just finished making my first ever baby quilt and can't wait to make another one! 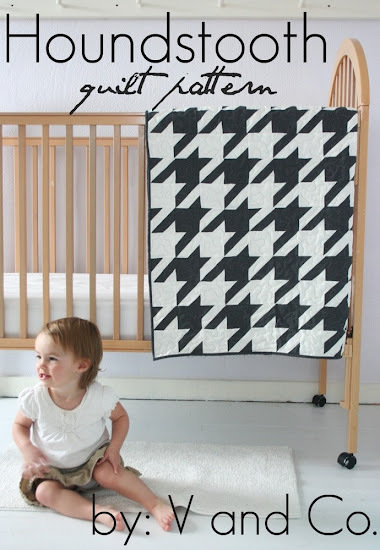 I love the houndstooth quilt it is darling! I love houndstooth! This quilt is very Mondo! This looks like a fun quilt to make. I'd love to try it. Thanks for the chance and good luck everyone! That is amazing - I've made quilts for girls before and not been inspired to quilt for my boy - that has now changed, thanks! This would be so neat. I haven't quilted in a while, but it is something I very much enjoy. That pattern would be a lot of fun! I've been eying this pattern for awhile and would love to win! awesome quilt! would love to give it a go. This pattern has been on my to-buy list for a while. Thanks for the giveaway, and the discount code! LOVE this pattern. I have a baby boy and numerous friends pregnant with them...would love this! I've eyed this quilt for awhile. It looks so fun! What a cool quilt! I know a little baby boy whose mommy would love it! I am obsessed with this quilt and pretty much all things houndstooth. I think it is great even for girls! I have never done a full quilt before so this would be my first attempt at quilting if I win! Thanks for the chance. I heart houndstooth, but then again who doesn't?!?! Her stuff is always gorgeous. Thanks for the giveaway! oh,how sweet! been drooling over this for some time. this is super cute and I would love it for my future little boy's room! Yay! What a fun quilt. AMAZING. and super super cute. I would love to win! I have been wanting to make this quilt! Looks like so much fun! I am a "quilt snob". I like very few patterns that aren't modern. I love love love this pattern! Thanks for the chance to win! I've been wanting to get this pattern, and if I don't win, I'll definitely buy it. It would be perfect for my baby's big boy room! This looks like a challenge I would love to take! So cute and an ideal baby shower gift!! so sweet would love to try this. I NEED to make that quilt!! I would defiantly make that quilt! I love quilting and sewing! I love love love this quilt! jenny and sullivan and parker at comcast dot net. I love V and Co! Such an amazing inspirational blog! Oh man I REALLY REALLY want to win this one. LOVE it!!!!!!!! Love it! What an awesome quilt pattern. Houndstooth also has a special place in my heart. I hope I win! Beautiful! I would love to make one. Thanks for the giveaway! I love houndstooth, and I need to make a quilt for my best friend's baby. Perfect! Gah! I love love love this quilt! It's so genius... I wish I had thought of it. Find me at thetinyhummingbirdblog at gmail dot com. I love her blog, and I really love this fabulous quilt! Thanks for a chance to win the pattern! I do love this pattern by V & Co. I have been following her for a while now. Thanks for the great giveaway! love her blog. love that quilt. That quilt is awesome! I love me some houndstooth. megcellent (at) gmail (d0t) com. I would love a chance to win the quilt pattern. always looking for new quilt designs! How fun! I love bold colors and patterns - this would be a great project! I'd love to make a houndstooth quilt! Are you SURE I can do this? :) Thanks for the chance to win! How cute!!! What a fun pattern :) Looks a little complicated, but I'd love to give it a try! LOVE that quilt! I'm not a quilter, but would LOVE to learn... what a great way to start! Thanks for the great giveaway! How lovely (and a wee bit intimidating)! This may be just the thing for me to get me into quilting after thinking about it for a year! This pattern would look so cool in our new nursery! I love Vanessa's quilts. This one has so much potential! I've been wanting to learn how to quilt for quite a while and winning this might make it happen! Love it! I love this quilt! And even though I don't quilt yet, I think this is incentive enough to get going! I have a slight obsession with houndstooth and LOVE this! I'd love to make this in grey and yellow! aldrich dot melissa at gmail dot com. Love houndstooth! Thanks for the giveaway! I've done a few quilts - none as complicated as this looks -- but it's so cute I want to make it! Hope I win! I hope I win...Pls pick me!! Love this quilt and with a new grandbaby on the way I can think of lots of fabrics to use!Thanks for the chance to win the pattern. This is adorable! My mom and Aunt are Amazing quilters and have been bugging me to make one! Maybe this can be my first! I've been in love with houndstooth before I knew the name!!!!!! It is my ultimate favorite! Thank you for the opportunity! This would be perfect for the room makeover I am planning for my boys! I would love to mkae this for my newest grandchild! My friend is having twins this summer (a boy and a girl) and I would love to make a pair of these quilts for her new babies. Wow, I would LOVE to win this pattern! I've been wanting to start quilting and this one would be great to start out with. Ohh my gosh i was just thinking this morning about how much I love houndstooth and want to own something from it! I LOVE this give away!!!! I love this quilt pattern!!! So boy and so cute! I think it is such a striking quilt and would love to win a pattern and give it a go! oh my goodness that's beautiful and so modern! I've been thinking about this quilt ever since the first time I saw it. So cool. This quilt is so adorable. I love it. I have been drooling over this pattern and quilt for awhile now - and trying to refrain, but you are killing me! I would love to win! :) Thanks for the chance! Ooh, I love this pattern! Too cute. Love Vanessa and want to craft JUST LIKE HER when I grow up! alibirdvigue (at) gmail (dot) com. Oh my oh my oh my...... I would sooo love this it's so lovely!!! I could make it in different colours for my boys :) thanx for hosting!! I love this quilt.. I am hoping to start quilting soon, & this is a beautiful pattern!! THat quilt pattern is awesome...I would love to try it...I hope I win!!! LOVE it! My little man would love this!! LOVE houndstooth! LOVE this quilt!! What a clever pattern. I just started quilting, but I have a son and all my patterns are girly. Oh, what a fun pattern! And perfect for a little man's room. I love houndstooth! And I love quilting! Thanks for the opportunity to win such a great pattern! I really like to quilt and am expecting my 4th baby! This would be fun to make, thanks for the chance! Hi Dana, I've been eyeing up the houndstooth quilt for a little while and would love to make it!! I've done one of her eat/play/sleep/repeat quilts from her tutorial and it was so easy to follow and came out beautifully. Thanks for putting some up as giveaways. I LOVE this pattern, I have it on my wish list. It is so great for a modern baby! Love it!!! And it's my birthday..so maybe I'll be lucky and win! that would be awesome! Love love love houndstooth. I would love to have this at my house. 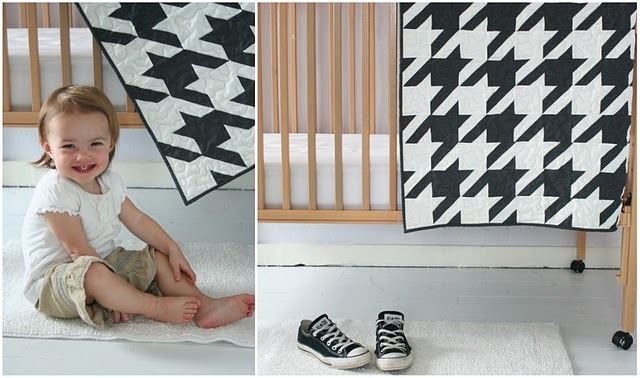 Oh, what a cool quilt pattern and give away! I have been drooling over this design for a while now. I love it! And, I would love it more if I won!